It may be hard to believe, but the perpetually sunny Spain does get cold. It will rarely dip below freezing and snow is rare – although yesterday it did snow for a good 15 minutes here in Madrid! Still, you will want to consider what to wear in Spain in winter while packing your bags. Layers are key in Spain no matter what the season. In winter if the sun is shining bright, it can easily get up to 50 or even 60 (in the South) degrees Fahrenheit during the high point of the day. Meanwhile, at night it can dip down to the low thirties and even twenties depending on where you are. That being said, here are a few essential items for a pack for your winter travels in Spain. As always, everything we recommend is 100% animal product free. Ok, we all know to pack some shirts, pants, and underwear. Since this post is focused on what to wear in Spain in winter, we’re only gonna talk about the essentials. As one of our Spanish friends put it, “wear a lot of black”. Spaniards, especially in cities, are quite stylish. This doesn’t mean you can’t wear jeans – far from it. Everyone wears jeans, just not the super crazy ripped ones that look like they’re about to disintegrate into a pile of fabric scraps. Basically, dress casually but nicely, and you’ll fit right in. We’ve lived in Spain for several years teaching English, and these are the recommendations we always make for what to wear in Spain in winter! Read more on teaching English in Spain: Auxiliares de Conversación: Your FAQs Answered! Hey girl, wanna do some alternative traveling? Yes, you’ll need a heavy coat and something that can handle some rain. When it comes to traveling light and practical, you need your articles to cover multiple purposes. Keep in mind that whatever jacket you bring, make sure it has pockets that can zipper to prevent pickpocketing. The Patagonia Nano Puff jacket is made from synthetic downlike material and stuffs into its own pocket when you’re not using it. As much as we kinda hate the puffy jacket look, they’re super practical for travel. It’s hard to beat a coat that’s designed for colder weather, can break the wind, is water proofish, and overall make you feel cozy and not exposed to the elements. You won’t be out of place at all wearing a black one. For more details and the latest prices on Patagonia Nano Puff jacket, go here for men and here for women. If you’re visiting Spain in winter, you’ll need a sweater. Bring your favorite all-purpose sweater, or if you don’t have one, grab this travel sweater with zippered pockets to prevent pick-pocketing. (You do need to be vigilant in Spain). This one is lightweight and comes in a variety of colors. If you prefer hoodies, check out thermal lined hoodie for men here and women here. 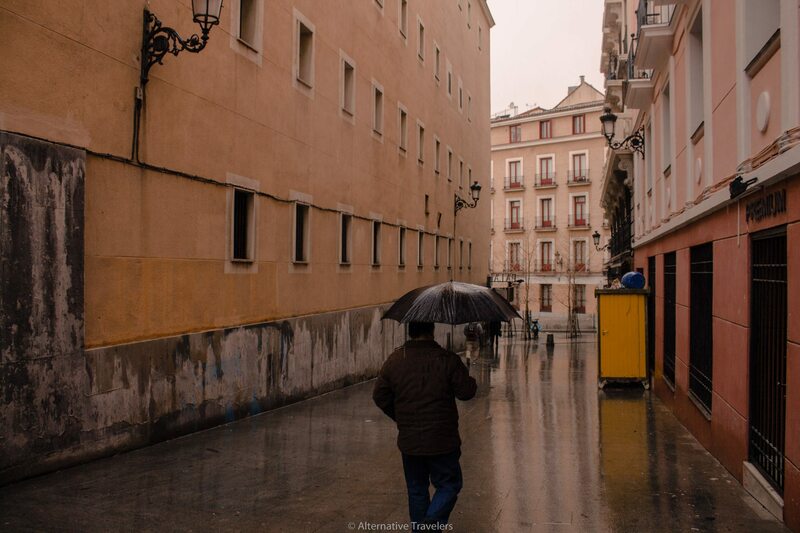 Apart from the coastal north (regions of Galicia, Asturias, Cantabria, Basque Country), it doesn’t rain often in most of Spain. However, winter is the time Spain receives the most rain. And of course, if you’re up north, it rains a lot. If you plan to do some hiking, we highly recommend Hi-Tec boots. They’re lightweight as far as hiking boots go and you can wear them on a flight to save space in your bag. These are great because they’ll do double duty for you. One, you need something rugged in case you do some off-road day trip walking (which we highly recommend – Sam wore a pair of hi-tecs for 500 kilometers of walking on the Camino de Santiago, and she still uses the same pair of hiking boots today). Two, you’ll have something that’ll keep your feet warm and dry, for when it does rain in Spain (more so up in the north, but less cold). Click here to read more reviews for these lightweight hiking boots. If you don’t plan to hike, you’ll just need some comfortable (key!!) walking boots or shoes. You can’t go wrong with a black ankle boot, and these boots have a memory foam foot bed for added comfiness. These are some must-haves when visiting Spain during October-March. If you’re moving to Spain for an extended period of time, check out our post: What To Bring When Moving to Spain. Do not leave a scarf off your Spain winter packing list!! First, a scarf seems to be the obligatory fashion for Spaniards in cooler weather. Don’t unleash the wrath of the Spanish grannies concerned that you’ll catch cold – remember your scarf! You can wrap them tight or loose, and even tuck them under your zipper line to increase insulation as necessary. You don’t need anything super warm as then you’ll get too hot when it’s sunny. Something with a t-shirt like fabric does the trick. We especially love big scarves that can be used as shawls on cold buses, trains, and planes. This travel scarf is cotton, doubles as a shawl, and also has handy pockets for keeping your phone when you don’t wanna carry a purse or man bag. You can also slip some euros in for a cheeky glass of wine or beer on a terrace. But you won’t need much – Spain is much cheaper than the U.S. or the U.K. Read more: Cost of Living in Madrid. Click here for more details and latest prices on travel scarves. Of course, it helps if your jacket has pockets to stuff your hands, but sometimes that’s not enough. You don’t need heavy gloves that reduce your dexterity – light thin ones should do the trick. These ones are lightweight and stretchy to fit all hands. Find touchscreen gloves on Amazon. Yes, you may want a warm hat. While I spend most of winter not wearing one, having the option is key, especially when you plan to be outside exploring. I’ve had this one from Carhartt for years and it’s hard to beat. None of my other hats have survived. It’s not itchy and can fit all sorts of sized heads (Sam steals it sometimes). If you’re not into hats, discreet foldable ear muffs would do the trick too. Don’t forget your sunnies! We’ve been talking a lot about the potential for rain in the winter, but it very well might be very sunny your whole trip if you get lucky! Unless you’re in the north, it would be very rare to spend a whole week in Spain without several sunny days, even in winter. These are some essentials that we take wherever we go, but that we especially recommend if you’re visiting Spain in winter. While you don’t want to lug your luggage around, it definitely helps to keep some things on you while you explore. We recommend a cross body bag that you can keep in front of you at all times, especially when going through crowds in the bigger cities like Barcelona and Madrid. Make sure you don’t get anything with zippers on the outside if you plan to sling it across your back as these can be easily opened and stolen from. This cross body bag only has a pocket on the side that goes closest to your body. If you plan to be doing more outdoorsy activities, you can go for a backpack instead so that it doesn’t weigh on your shoulders when you’re wearing it for a long time. We recently just got this foldable backpack with a rain fly. It has tons of zippers, pockets, is waterproof, and packs into itself when you’re not using it. Order it on Amazon and they give you a free phone armband for running. As you’ll quickly notice, Spanish restaurants don’t give out water as readily as U.S. ones. Keep a water bottle on hand and you’ll always be hydrated. Just fill up from bathroom sinks – Spain’s tap water is fine to drink. We have been using our collapsible bottles for the past 2 years and they’re still going strong. Click to read more reviews of Vapur water bottles. If you spend any length of time in Spain, chances are you’ll do some grocery shopping, even if it’s just to pick up some snacks. Unlike in the U.S., you have to pay for plastic shopping bags in Europe, Spain included. So save your money (and the environment of course) by bringing your own. We love the ones that pack into themselves so they take up practically no space when you’re not using them. For a list of what we take with us in order to reduce our environmental impact on the go, head to our Eco-Friendly Packing List. Chances are you’ll find yourself on a bus or train traveling between cities, even if it’s just for a day trip. Use that time to learn a bit about the place you’re visiting. We rounded up the top 25 Books About Spain to Read Before Your Trip with novels set in Spain as well as non-fiction books on the various regions of Spain. For a catch-all book about how Spain’s past influences the country today, check out Ghosts of Spain: Travels Through Spain and its Silent Past. For places to visit in Spain in winter, head to our Spain archives.